SunLine Transit Agency provides local bus service in Coachella Valley, covering Palm Springs, Cathedral City, Coachella, Desert Hot Springs, Indian Wells, Indio, La Quinta, Palm Desert, and Rancho Mirage. It connects with Amtrak Thruway, Greyhound, and Morongo Basin Transit Authority. 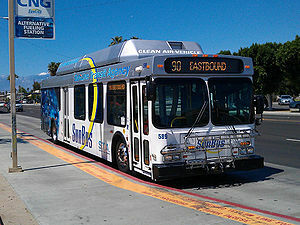 SunLine also provides commute bus service to Riverside, connecting with Riverside Transit Agency and Metrolink.